As a leading pipe distributor, we at P.I.T. Pipe stock and supply a large inventory of caissons for a variety of applications. Caissons are commonly required in construction projects when it becomes necessary to drill into river bed material below surface water to found pilings or for pier foundations. Caissons are generally large diameter pipe that is made from rolled, welded, or spiral weld pipe usually 3ft or more in diameter. Basically a caisson is a large watertight restraining structure or chamber from which water is kept out by air pressure and which allows construction and foundations to be built underwater. 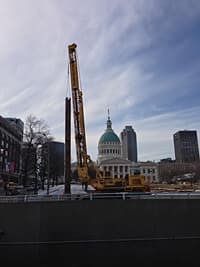 Caissons can also be inserted into the ground and then filled with concrete. The use of caissons creates a high strength foundation system for bridges and other types of construction. At P.I.T. Pipe, we can supply you with caissons in all specification types and sizes, including rolled and spiral welded styles. We can also have anything you need fabricated or modified to your exact specifications or needs. If you need turning slots, j slots, or even cutting teeth attached, we can accommodate. Contact us at PIT Pipe today for all your steel and metal pipe needs. Caissons are generally used during bridge construction, but they can also used in the construction of buildings an other structures as well. They are drilled or driven into the ground or riverbed material to hold back water and other moisture when founding pilings. In these cases, caissons are larger in diameter so that smaller diameter pilings can be ‘pile-driven’ or drilled inside the steel pipe. Steel caissons are incredibly durable and make for a very strong foundation in any structure. Steel caissons can be manufactured from welded, rolled, and spiral weld steel. At P.I.T. Pipe, we can fabricate, cut, or splice any steel caissons to your required specifications. We can also have any type of special coatings applied to the pipe to extend the durability and life of any steel pipe. 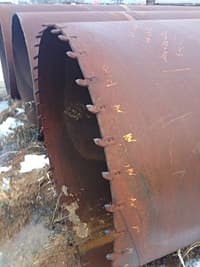 We can even custom cut caissons, add cutting teeth to the end, fabricate slots or fittings, or offer any other modification you may need and deliver the pipe directly to your job site. At P.I.T. Pipe, we are your number one choice when it comes to your caisson and steel pipe needs. We stock and can deliver any custom length or custom modified caissons. We can also have your caissons specially coated to increase durability and longevity. In addition to a complete selection of steel caissons, we P also carries a wide variety of new, used, and surplus steel pipe and steel tubing to meet all your piping needs. We can also buy new, used, or obsolete steel pipe. We supply structural steel such as i-beams, steel plates, and also can fabricate steel for any structural needs. Contact P.I.T. Pipe today to learn more and for all of your steel and metal pipe needs.